I hope the above edit has helped you to find the perfect dress in which to attend your next springtime wedding! As you'll most likely be able to tell, I've leant towards pastel shades, gentle materials (hello tulle) and plenty of embellishment. Anything romantic and fairytale-esque tends to tick the right boxes when it comes to springtime special occasions - especially weddings. 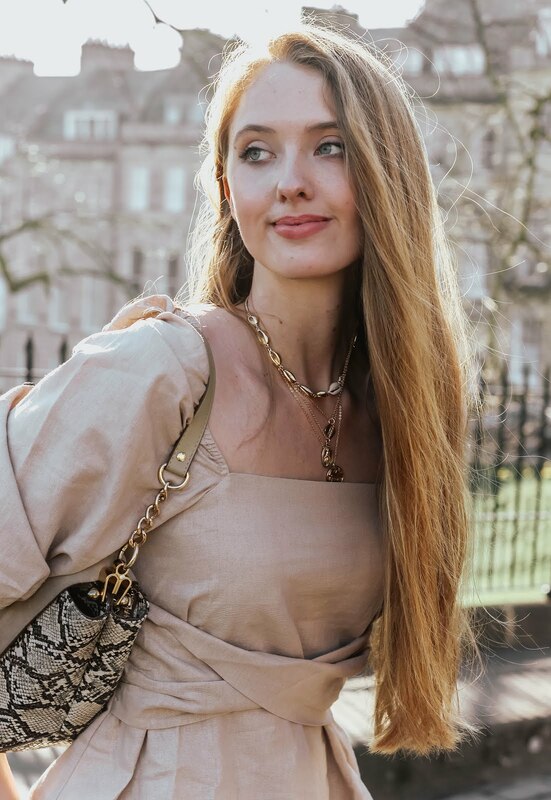 So, alongside the Monsoon Brooke Embellished dress worn in this post, a couple of my other favourites include this embellished top maxi dress by Frock and Frill Premium, and so many Needle & Thread beauties, including this fairytale princess high neck maxi dress. What a dream! Do you have any weddings coming up this season? 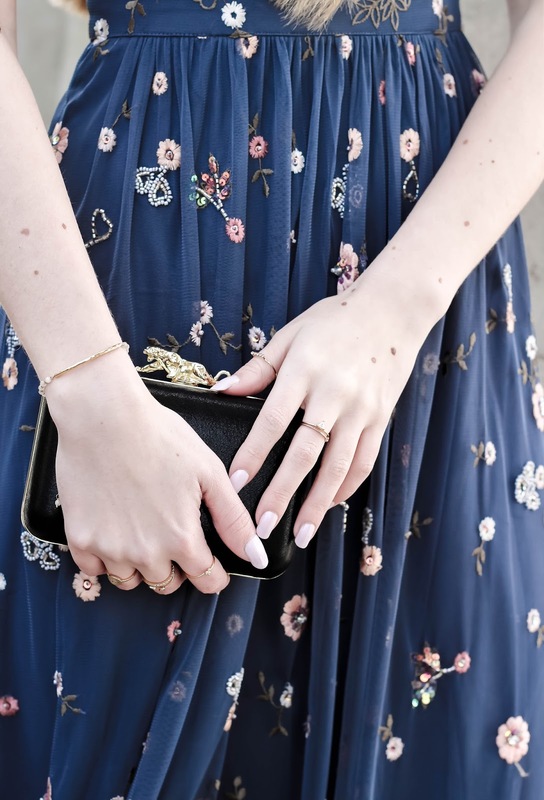 Oh, and I can't wait to hear your thoughts on this embellished midi dress in the comments below, as well as whether anything stood out to you from my edit of embellished dresses for springtime weddings?! Liked this post? You might also enjoy >> Spring Edit | The BEST Cut Out Dresses! Our inner magpies... XD I was cracking up when I read that. On another note, girl, you are the epitome of class and sophistication! This dress is so pretty on you. I fancy embellishments so I deeply adore these embroidered details on your dress. I went to my friend's hen night the other weekend, aside from that wedding so far I've only one more until autumn. I hope your week is going well. Hehe we are both sharing our spring wedding guest dresses! I love that yours is more fancy and the embellishments are beautiful. You look stunning Gabrielle! This dress is so dreamy!!! Love the colour so much! What a beautiful dress. I like the embellishments. I have not been invited to any weddings this year :( but I've always used the opportunity to go over the top. I'm speaking fascinators, bold colours, sky high heels, the works! Thanks for the style tips. Have a good day Gabrielle. This is perfect spring wedding dress dear- you look absolutely stunning. You must've been the best guest dressed at your cousin's wedding! 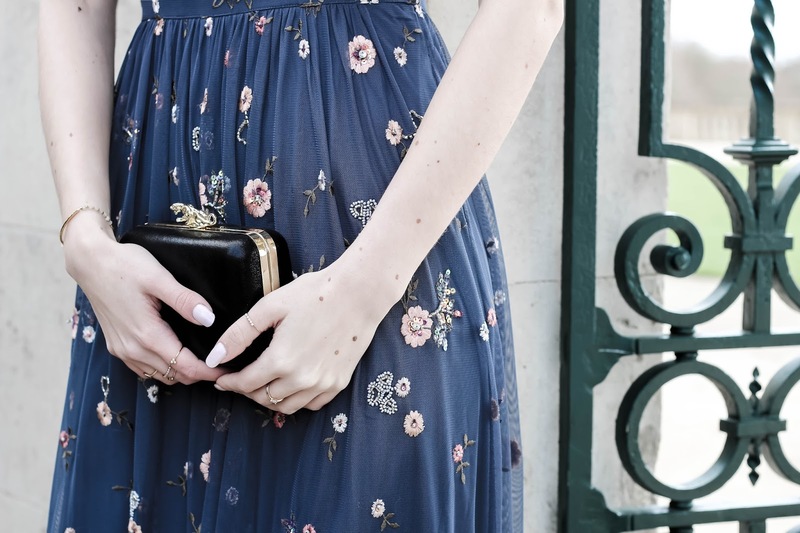 you looked amazing :) You certainly found the right dresses for a wedding guest. So far, I have not received an invitation to any wedding but if I do, I know where to search for an outfit :) thanks for sharing ! I feel like everyone around me is already married, so no, no upcoming weddings for me. You look beautiful in this dress!! That dress is literally gorgeous on you! Love the embellishments! You look stunning Gabrielle! I won't be attending a wedding anytime soon but I would love to wear the dresses that you have selected anyways. Hope that your cousin had an amazing day! This midi embellished dress is absolutely beautiful and you wear it so perfectly! I love the heels and the coat you paired it with. Such a lovely wedding outfit! I'm actually invited to two weddings this April, and I still haven't figured out what to wear, so this inspiration post is pretty perfect for me right now. 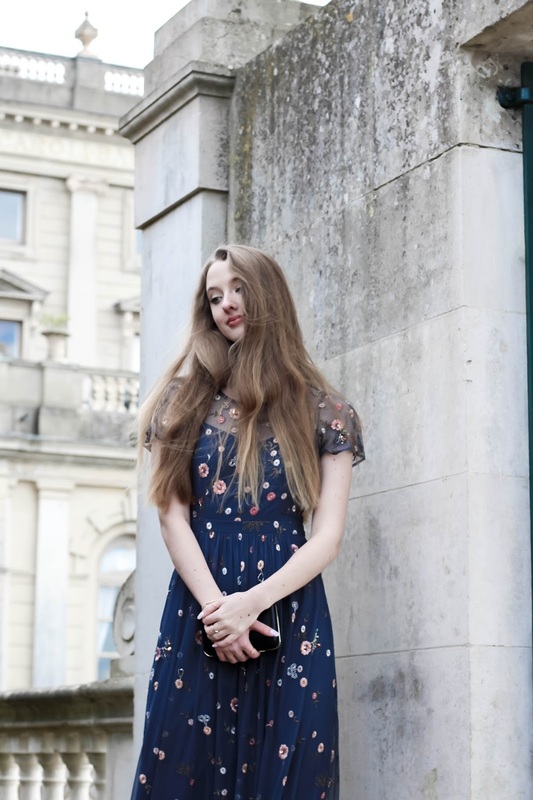 I already had one special occasion this month, a First Communion party but I can't remember what I wore, I only remember that I got dressed up and that I was glad that I did because everyone else was dressed up too. With weddings you always know you're supposed to dress up, but with other occasions it can be hard to tell. I think it's always best to wear something appropriate for any special occasion (even if it is a small home party), just to be on the safe side and show respect to the host. What a beautiful dress, Gabrielle! It's so sweet and flatters your figure really well. Yes, I actually have a wedding coming up next month! Love your dress; it looks very romantic and suits you perfectly. Such a wonderful and delicate dress, love it :) You look so beautiful! I think this dress represents you in full: it's elegant, sophisticated, chic, really beautiful!! And then blue fits you so well! I love the embroidered details! Amazing also all the other clothes you have chosen! That's such a cute dress, perfect for a wedding as it's a classic cut and style made even prettier with the lovely embroidery. Really nice for spring too! 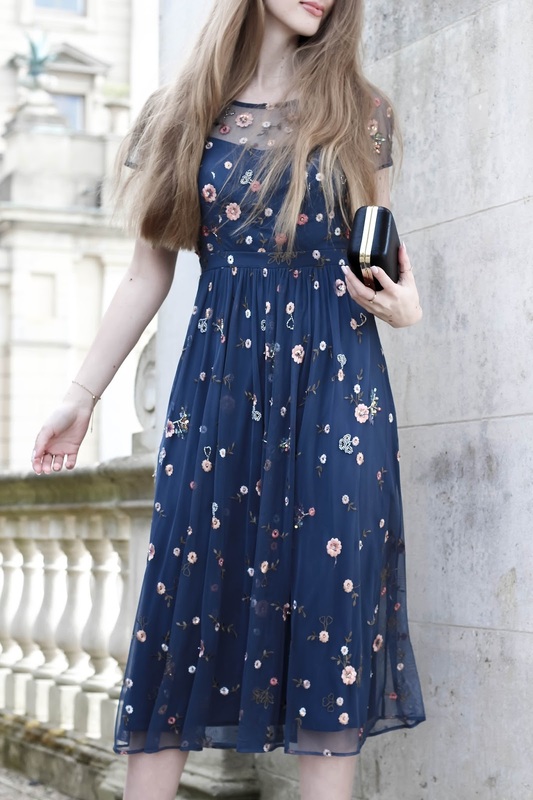 Leave it to you to find the perfect dress for a wedding guest Gabrielle! The silhouette, color and delicate embellishments are pure classic chic and elegance! You look gorgeous! Gabrielle what a beautiful dress. I love the embroidered flowers. You look very elegant. it has been such a long time since I’ve been to a wedding. Ahhh I am in love with this dress! So feminine and beautiful! Thanks for sharing, beautiful girl! A beautiful dress for a very elegant outfit! Wow, the dress is so pretty. I love how feminine and delicate it is and really perfect for a spring wedding. It fits you beautifully too. This is such a lovely dress with happy embroidery. I would totally wear this. You look stunning! I've three weddings this year so thanks for the choices of dresses here. I can't believe it's wedding season. I really want to go to one. It's so fun to dress up and celebrate love. You look stunning in this embellishment beauty! Talk to you soon! This is a really beautiful dress Gabrielle and love the details and colours. As you know I love anything feminine and embellished so this really appeals. Also I noticed how much you're smiling :) Lovely to see! That dress looks absolutely stunning, so elegant and glamorous yet simple & effortless. 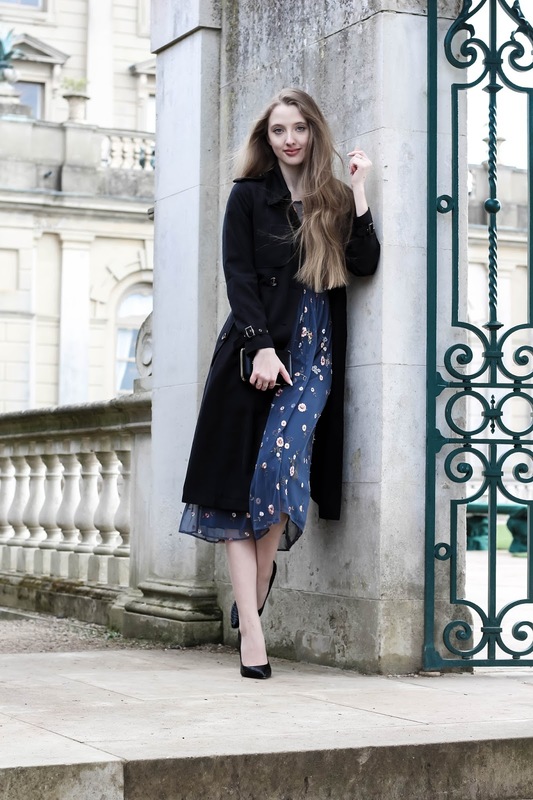 It's not easy dressing up for a Spring wedding (because of weird weather), but I like the idea you share! Definitely to copy! Such a stunning dress! Love the vibes of your photos!! Such a pretty dress! It looks so romantic! I have no weddings coming this season, honestly, I do not know if I'll see any wedding in 10-20 years, I'll have to wait for my nieces since none of my cousins are getting married - they do not even plan that, I also do not plan to get married, same my best friends. That's such a lovely dress you got there dear, really cute floral embelishments, and looks lovely with black accents, especially with the coat. Super elegant! It's beautiful. 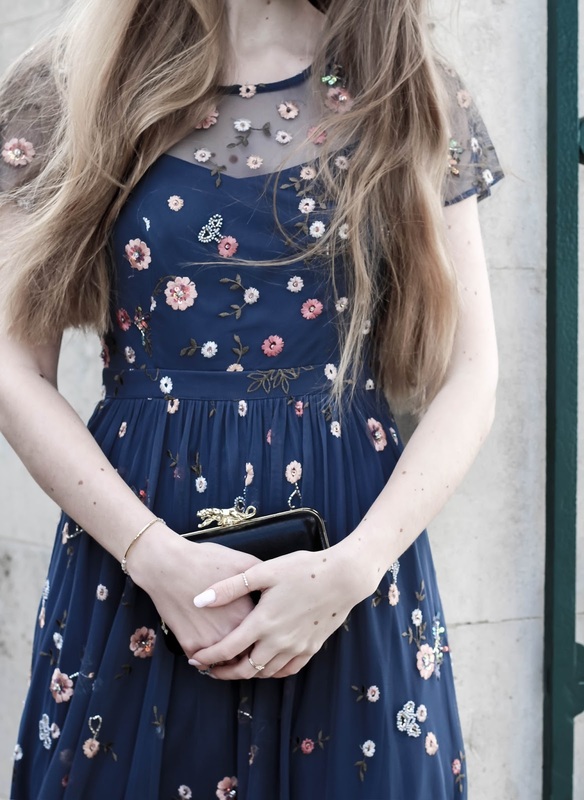 I'm a big fan of navy and the floral accents are so pretty on it.